Letters and numbers. Glue several bread ties together to represent letters and numbers. Set the letters and numbers aside to dry. 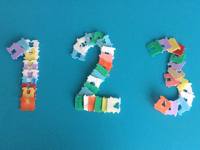 Encourage children to place them in alphabetical or numerical order. Since many children learn more easily when they are given the opportunity to manipulate, this simple activity is a great way to help children learn the alphabet or work on their counting skills. Sorting game. 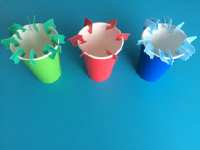 Arrange a few colourful paper drinking glasses in a row on a table. Give each child a small bowl filled with colourful bread ties. Have them slide each bread tie on the rim of the glass of the corresponding color. Maracas. Deposit several plastic bread ties in a paper plate. Glue a second paper plate on top using hot glue, inserting a wooden stick (Popsicle stick) between the two plates before completely gluing them together to represent a handle. Children will enjoy producing different rhythms with their maracas. Road network. Use a large quantity of plastic bread ties to represent an original road network on the floor (two lines, with room between them for toy cars). Children will enjoy driving toy cars throughout the network they will have helped you create, but they will like creating new roads over and over again even more. Outdoors, show them how they can press the bread ties in the sand (standing up) to create roads for toy trucks in your sandbox. Jewellery. Bread ties can also represent colourful jewels. 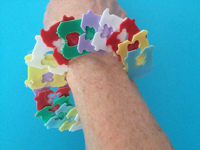 Use them to create bracelets by gluing them together or slide them on a pretty ribbon to design unique necklaces. Tracking devices. When you go for a walk with your group in your neighbourhood (or just in your backyard), give each child a small container filled with bread ties of a different color. Invite children to deposit the bread ties here and there as they walk. After a while, turn around and encourage children to follow the trail they left behind, picking the bread ties up one by one all the way back to daycare. If you wish, each child can collect the bread ties left behind by another child (different color). This is a great way to keep children busy and interested in walking. Colourful patterns. 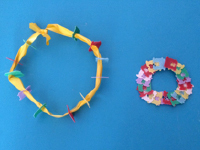 Use colourful bread ties to create simple patterns. For example, you could set a yellow bread tie on the table followed by a pink bread tie. Deposit a third bread tie next to the first two to complete the base of your pattern (yellow, pink, yellow...). 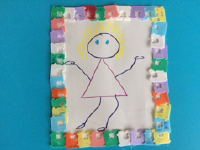 Children can complete the patterns you have started and even have fun creating new ones. Spending money. Use plastic bread ties to introduce children to the concept of money. 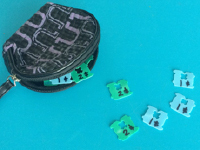 Give each child a few bread ties in a small purse or wallet. Set up a play store and encourage them to count bread ties to pay for their purchases. With older children, you could even write a value on each bread tie and have them perform simple addition. For example, blue bread ties could represent $1 whereas green bread ties could represent $2. If a child's total purchases equal $4, he/she could therefore pay with two green bread ties, four blue bread ties, or one green bread tie and two blue bread ties. This is a great introduction to mathematics. Best of all, children will have so much fun, they won't even realize they are learning as they play! Manipulation bin. Ask parents to help you collect bread ties. Before you know it, you will have more than enough to fill a manipulation bin. Here, the bread ties will replace the rice or dry pasta you would normally use. From there, it's up to you. You can hide whatever you want among the bread ties (stickers, seashells, laminated pictures, etc.). Provide tiny spoons or plastic shovels children can use to dig out the surprises. You may also choose to ask children to find bread ties of a specific color for a color discrimination activity that will also represent a great fine motor skills exercise. Pastel picture frame. Invite children to draw on a piece of heavy cardboard or construction paper. When they are done, show them how they can arrange bread ties all the way around their drawing to create a pretty frame.